5 ABsolutes To Eliminate Your Muffin Top For Spring! Hey, did you hear about that new diet called .… Oh man I forget what it is called but you eat only protein and they allowed you to have one big chocolate chip cookie a day. 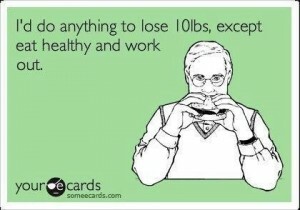 Yeah .… they say you lose 10 pounds in a week! Really .… protein and a cookie? Yes, but you are only allowed to eat about 800 calories a day. WOW, you know anyone who is doing it? Yes, Susie did it about three months ago. She lost like 30 pounds!!! Really… is she still doing it? Well, no because she said it got too expensive and she could not just eat the same food and that little amount forever. Oh OK, does she look good? Well she got a little too skinny at first, then she gained a few pounds back and was looking better. Was looking good? What does that mean? Well I just saw her and she put the weight back on and THEN SOME. Have you heard a story like this or been that story? I’m sure you have. We all have been there trying to find that magic diet or pill to create the perfect you. Let me give you some advice, save your money! I am sure you know someone whose weight never changes and always stays active and energetic. You probably say “How do they do it?” The great news is that there are five easy principles, if you do daily, that will transform your body. Here we go! #1 Take Omega 3’s daily! Our bodies don’t produce it! Omega 3 is an essential fatty acid for brain function and overall health. Did you read that word essential?!? Studies show that 95% of Americans do not take Omega 3’s daily. Studies also show that low Omega 3 intake causes more deaths than high trans fat intake, up to 96,000 deaths a year. So we are not getting the essential fats that our body needs. There are also studies that show it eliminates belly fat because it controls cortisol levels due to stress. Each day you must take your Omega 3’s with a multi-vitamin to set the foundation for a great nutritional day. We here at Inspire use the World’s best Omega 3. It is called Mila. Go to our website and read about it! #2 Eat Slower… I told you these principles are easy! Just slow down, you deserve it. We are running crazy so take the time and sit and really enjoy your food. A few tricks to accomplish this – chew your food (you may actually taste it now) and also put your spoon or fork down each time you take a bite. Lastly, try to turn off your phone and rest your mind and small talk with who you are eating with. It’s amazing how just that little trick will reduce your stress level. #3 Eat 80% to full… Studies show that portion sizes have doubled since the 1960’s. Our bodies don’t need that amount of food that we are eating to feel great. Advertising and marketing has brain washed us into eating huge amounts. The idea here is to never to eat to full (like you feel the need to unbutton your pants because you are ready to pop). Just by doing this, imagine how many calories you will eliminate. #4 Eliminate Bad Non Nutritional Foods For Nutritional Foods… The idea here is simple ELIMINATE SUGAR! Our body needs good, whole, nutritional foods to feel great. We live in a processed world and its making everyone a slug. No Energy! Change your FOODS = Change your LIFE! #5 Drink Water First If You Feel Hungry! Simply when you feel hungry drink an 8 ounce glass of water. Wait about ten minutes and see how you feel. If you are still hungry, eat, if not, you were just thirsty. Many times we confuse hunger for thirst. Studies show Americans are not hydrated and it’s scary. Dehydration causes many health issues. The reason is because 60% of the human body is water, the brain is composed of 70% water, lungs are 90% water, lean muscle tissue contains about 75% water, 80% of our blood is water, which helps digest food, transport waste and control body temperature. Get the picture?! Rule of thumb, drink ½ your body weight in fluid ounces daily to stay properly hydrated. I leave you with this question. Do you know anyone who lives on any of those crazy marketing diets for life? (It got quiet) So you have two options live the weight loss rollercoaster and waste money or eat clean, nutritional grocery store foods which will last a lifetime. We must stop falling for the marketing schemes and start fueling our bodies the way we were made. This week focus on these 5 principles and I guarantee it will kick start your transformation to a healthy life. Eat Right… Train Hard… Live Inspired!